This collection contains six 1950s Adult pass tickets to the PIX movie theater, 13 1950s tickets to the Ft-Roc Auto Drive-in theaters. The tickets were owned by Bill B. Bryant, Bob Bryant, and Roy Ennis. 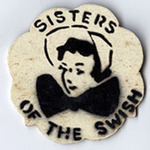 Also included is a "Sisters of the Swish" pin celebrating Rock Hill, South Carolina's centennial celebration and festivals in 1952. The Rock Hill Memorabilia was donated to the Archives by Ms. Gail Kendall. Louise Pettus Archives and Special Collections, Winthrop University, "Rock Hill Memorabilia - Accession 1218 - M583 (636)". Finding Aid 768.